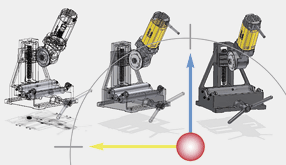 Highly modern production – guarantor for REMS quality products. Nobody hardens metal better than us. Therefore, we do it ourselves. REMS – Market strength through a consistent product and sales philosophy. Touch. Compare. Select. Promoting the mutual sale. At the forefront of technical advance. Development is never finished. Since its foundation in 1909 REMS has been developing products for the pipe working, especially for sanitary and heating installers. At first, hand tools and then subsequently machines and electric power tools. The stipulation of the company founder Christian Föll “REMS must be superior” has always been the benchmark for our actions. 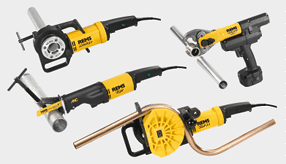 Today REMS is a leading manufacturer of machines and tools for the pipe working. REMS development engineers have persuasive, groundbreaking ideas which ease the daily routines of the installations professional. They have all the significant requirements in their focus and use all their comprehensive practical experience. 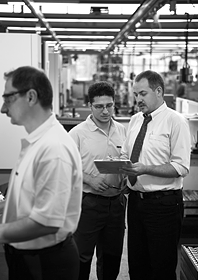 Experts from all areas of industry ensure that every possibility for improvement is integrated in the new develop­ment. In this way the perfect tools for the tough demands of the building site are created. The REMS products are highly valued because of their innovative technology as well as their high standards of quality and are being used everywhere in the world. Both trade and user profit in this way. Again and again REMS is able to maintain its position at the forefront of technical progress as a result of its innovative products. Many valid national and international patents prove this. Through the application of modern construction and development techniques, the quality of REMS products has been to the fore from the beginning: Safe use, robust design, simple operation, durability. New ideas, technical progress and REMS belong together: e.g. REMS Amigo, REMS Tiger, REMS Curvo, REMS Akku-Press – products, which have revolutionised the application technology.